Hopes of an all-Bourne Town final in the Under 18 League Cup didn’t quite materialise for the Lincolnshire club on Sunday. Bourne Town Black certainly had no problems cruising into the final, crushing Division One rivals Riverside 14-0. 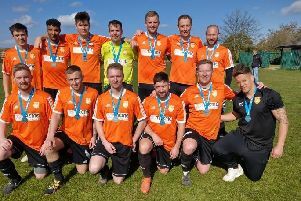 But Division Two side Bourne Town Blue were unable to get past Division One leaders Northern Star to join their stablemates in the decider. They were beaten 2-0 with Ryan Ellwood grabbing both Star goals. On target for Bourne Black were Ian Goode (3), Zak Munton (3), George Hick (2), Oliver Reed (2), Max Cooper, Conor Culverhouse, Lewis Fountain and Benjamin Moss. In the Under 16 League Cup, Yaxley Lynx edged out Eye United 4-2 after a thrilling semi-final battle that went to extra-time. Liam Sanderson (2), Liam Hatfield and Matthew Dale were the boys who fired Yaxley through to the final where they will meet Pinchbeck. In Under 16 Division Three there was a first win of the season for Whittlesey Athletic. They pipped Wittering Harriers 2-1 with goals by Adrian Chrupczalski and Jose Cordero-Rivera.